Atlas Map Markers - Updated with MCM-Turkish Translation Önce bu modu kurun. Anyone wishing to do a language translations is free to do so. Just msg me the link and i'll try to add them here for all to see. 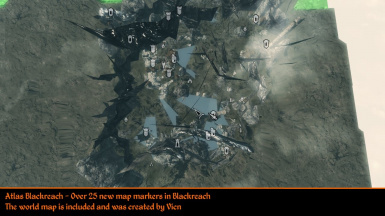 Vicn has allowed me to use his maps of Blackreach, Forgotten Vale and Soul Cairn. Please ENDORSE if you like this mod. 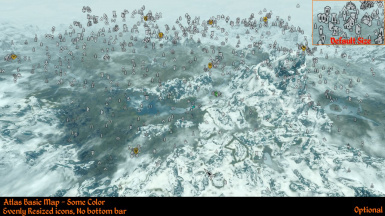 Over 470 locations in Skyrim. Discover hard to find Skill Books, Camps, Dungeon Exits and Places of Importance and more. 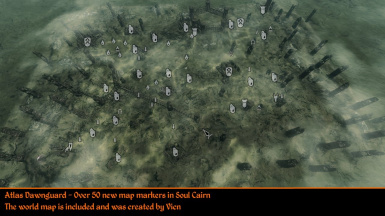 Over 130 locations for Dawnguard with world maps of Soul Cairn and Forgotten Vale and you can fast travel in both areas. 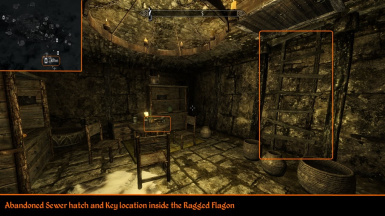 Over 80 locations for Dragonborn. Includes Gem Geodes. 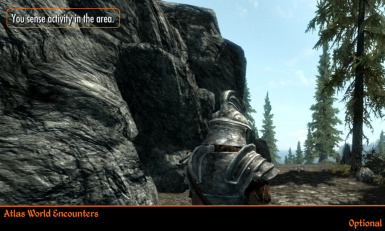 The Official Prima Skyrim Legendary Game Guide was the primary resource of information, Lore friendly location names. 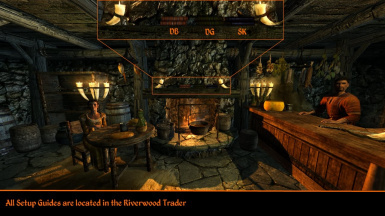 Locations can be configured using the setup guides found in the Riverwood Trader, Millions of possible combinations. Locations can be displayed as Default, Undiscovered, Discovered or they can be Removed. Each location will appear on the compass when you are within range of it like normal. 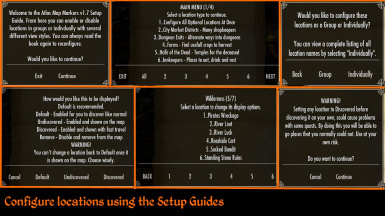 20 quest related locations (in bold) that only appear when Skyrim calls for it. All ore mines have their ore type inserted into the mine names. Example...Gloombound Ebony Mine. 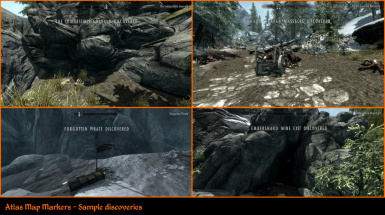 Adds hours of extra game play for Skyrim adventurers by marking some of the most unique locations in Skyrim. Discover treasure map loot, shrines, unique items, wilderness loot, farms, caves, ore mines and so much more. 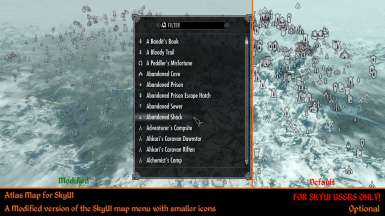 Optional Support Mods including map menus with smaller, evenly sized icons, Special version for SkyUI users. 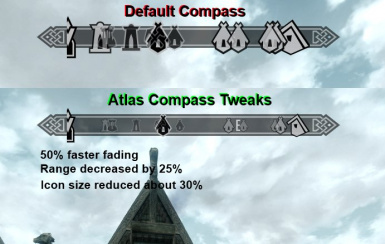 New Legendary version that combines the 5 core Atlas mods together into One ESP file. All files are stand alone mods, they are not dependent on each other. they are all outside in the open world. It will not add the icons to the map until you discover each location. terminates. It does not run in the background or store any settings. Makes minor changes to the default compass to reduce the clutter. Increased fading by 50%, Decreased Range by 25%, Reduced icon size by about 30%. This is for SkyUI users only! Alternate map menu with evenly resized smaller icons, default colors, no bottom bar. Not compatible with SkyUI's map search feature. To use with SkyUI, go to the SkyUI MCM Menu/Advanced/SWF Version Checking and untick the Map Menu option to disable the warning message. Alternate map menu with evenly resized smaller icons, some colors, no bottom bar. This is for users of Open Cities only! Adds a very simple onscreen message in the upper left when a World Encounter has been triggered. There are 95 possible Offical World Encounters in Skyrim. Even more if you have the DLC's.They can happen all over Skyrim and sometimes you may not even know it is taking place near you. Some are moving and some are static scenes. They could be in the direction you are heading as well. It will not tell you where to go, only that it is taking place because you set off the event. Always backup your save games and INI files before trying new mods or edits. As of 1.7 almost all locations are enabled from the start. You will need to use the Setup Guide to reconfigure some locations. Just overwrite the old files and your done. Your current discoveries will not be effected. Overwrite all old files if asked. These mods should work with most other HUD, quest or compass mods. They only add more map markers to the world map to discover. Mods that add map markers to the same locations are not advised. 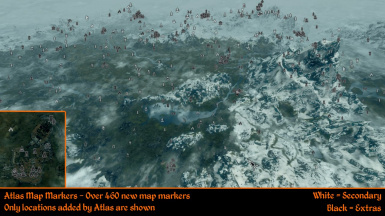 ===================================================================================================================================================FAQ===================================================================================================================================================Q..I have map markers for Blackreach, Soul Cairn or Forgotten Vale on the Skyrim world map.A..Move Atlas down in your load order. 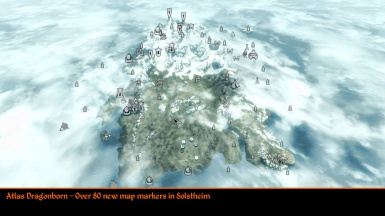 You have another mod that edits the world space.Q..Are you going to add MCM menusA..Maybe some day but right now the answer is NOQ..SkyUI gives me an error message when I use the maps with no bottom bars.A..These maps are Not compatible with SkyUI's map search feature. To use this with SkyUI, go to the SkyUI MCM Menu/Advanced/SWF Version Checking and untick the Map Menu option to disable the warning message.Q..When I open the setup guides, I don't see any menusA..Make sure you have the scripts properly installedQ..Can I use the modified SkyUI map without using the ESP files? I am using SkyUI.A..Yes. All Atlas files are stand alone mods and do not require any other Atlas file to function.Q..When I fast travel to a new location within a city, I end up in some weird world with no buildings.A..You installed the incorrect version for the Open Cities mod. Reinstall Atlas to fix. NMM is terrible with version numbers and will often tell people they need to update the mods when none are available. The only file that will always be correct is Atlas Map Markers. All of the other files will always show as needing an update unless they are the same version number. This is a problem with NMM, it does not check the versions of the files, only the mod version. As long as the version shown in the "Name" and "Version" columns is the same, you are fine. 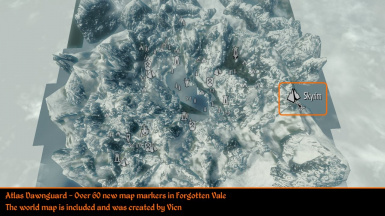 The "Latest Version" column will always show the version for the latest Atlas Map Markers only. When NMM asks to Upgrade, I select "No" then "Yes to All". I don't use NMM and can only help so much with a tool I don't use. Both Atlas Map Markers(AMM) and Atlas Open Cities(AOC) share the same file name. This will allow you try or switch to AOC and not loose everything you had discovered. Only the locations within the 5 major cities will change. Just open up the Setup Guide and select the locations you want to repopulate the cities with. If you dont want to use AOC, you can switch back to AMM your discoveries will still be intact. Existing Open Cities(OCS) users can just load AOC before OCS and begin exploring.